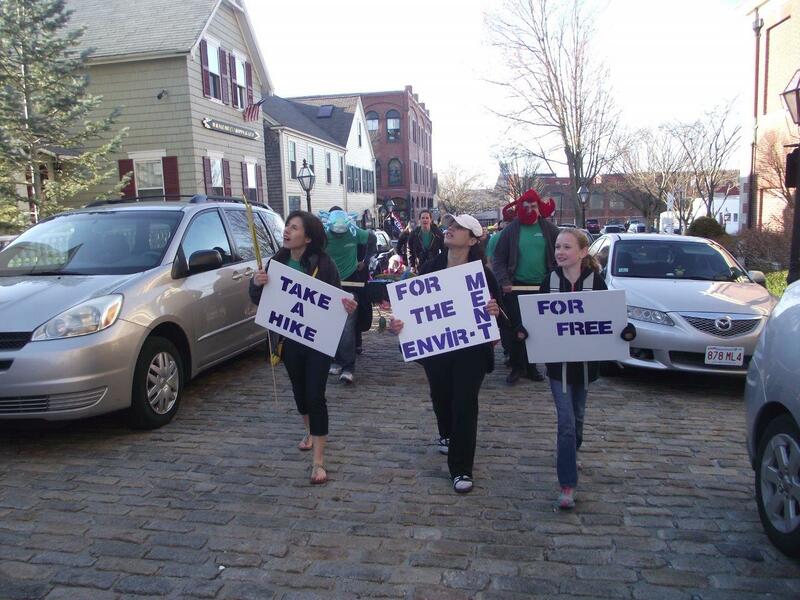 This spring, five University of Massachusetts Dartmouth business students partnered with the Lloyd Center to create a sustainable parade float for AHA’s “Earth Eve” parade in downtown New Bedford. 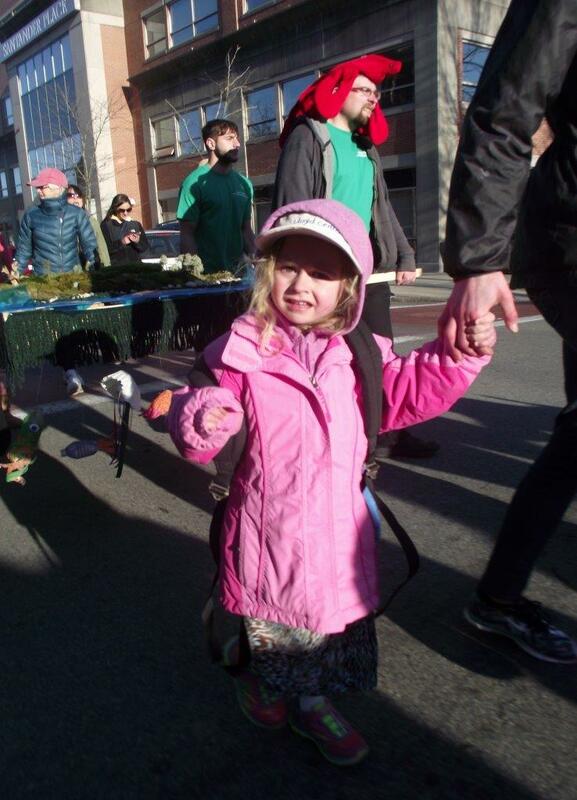 Participants in this annual event march through the streets celebrating environmental and social stewardship. The only rule? 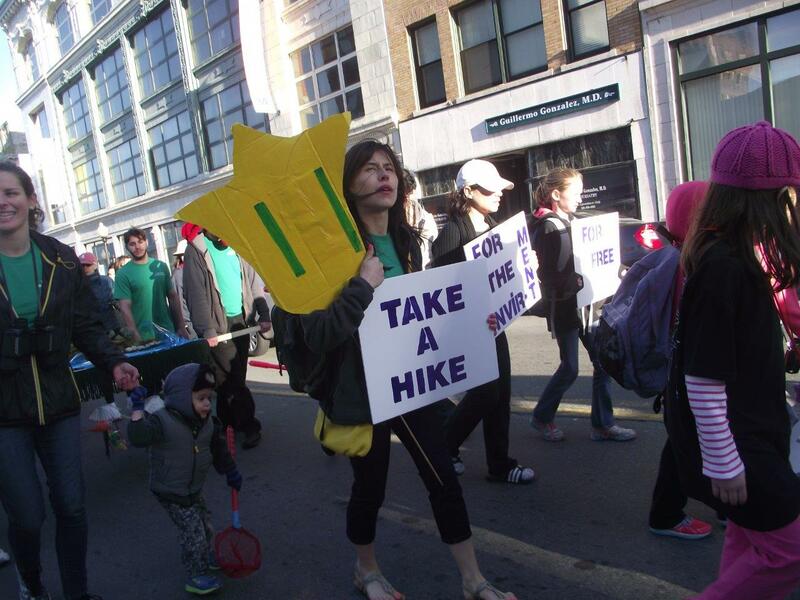 All parade floats or processions must be people-powered! 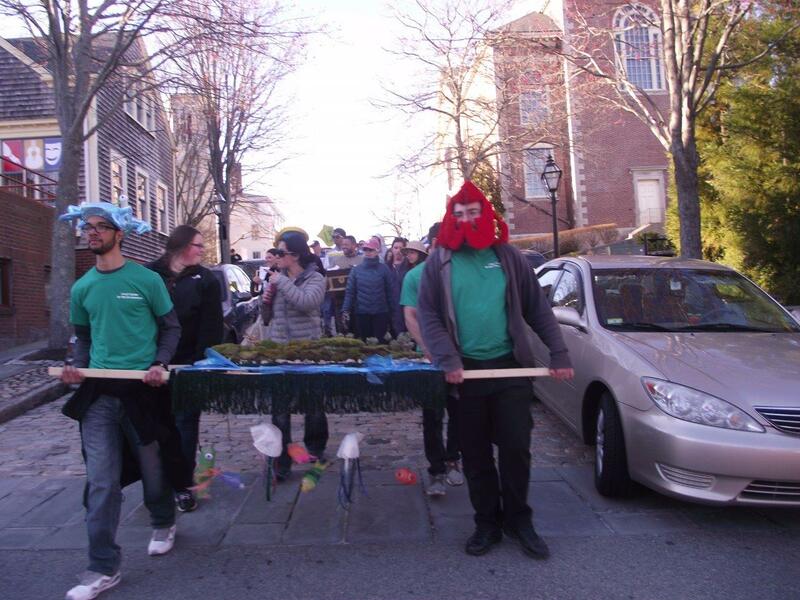 The self-named “Eco-Friends” and Lloyd Center staff members constructed the float entirely out of recycled, reclaimed, or donated materials. A wooden pallet, donated by Northern Wind Seafood Inc., served as the base of the project. Its top was made to look like a shoreline inspired by the Lloyd Center’s own 82-acre trail system. Patches of bright green moss collected on the trails were arranged to look like verdant hills, dotted with tiny twig trees. Rocks from the Lloyd Center’s driveway were placed near these sloping “hills” to represent a rocky shoreline, and blue cellophane donated by the Center completed the beachy scene. Whimsical undersea creatures, fashioned from recycled water bottles, were hung beneath the pallet. 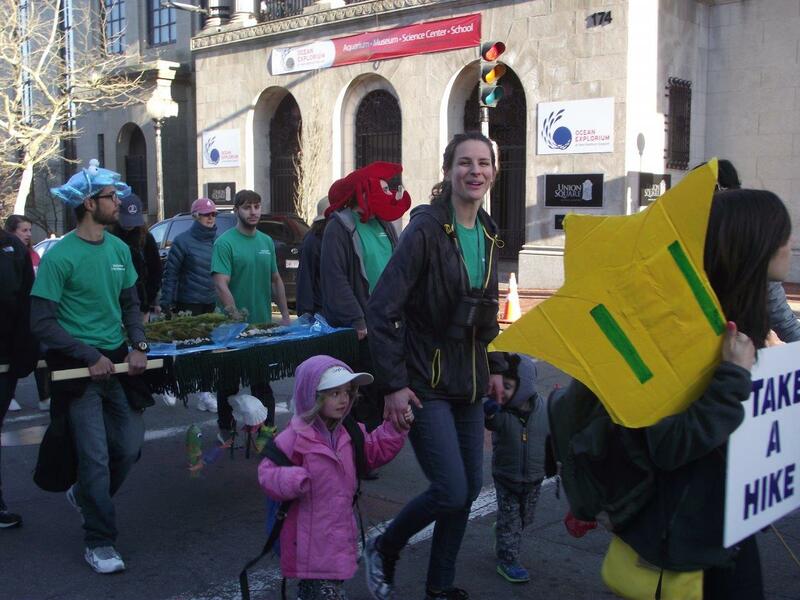 On Thursday, April 10th, all five “Eco-Friends”, Erika, and thirteen volunteers—ranging from ages 1 – 55—represented the Lloyd Center in the Earth Eve parade. 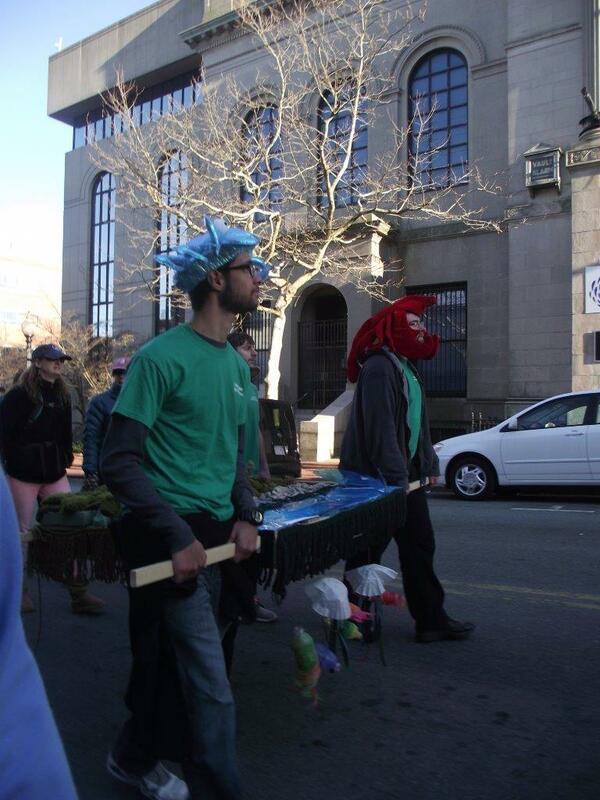 The procession symbolized and celebrated the Center’s commitment to community, sustainability, and the SouthCoast. And while the Lloyd Center is grateful for the “Eco-Friends” partnership, the group feels as if they’ve benefited as well. 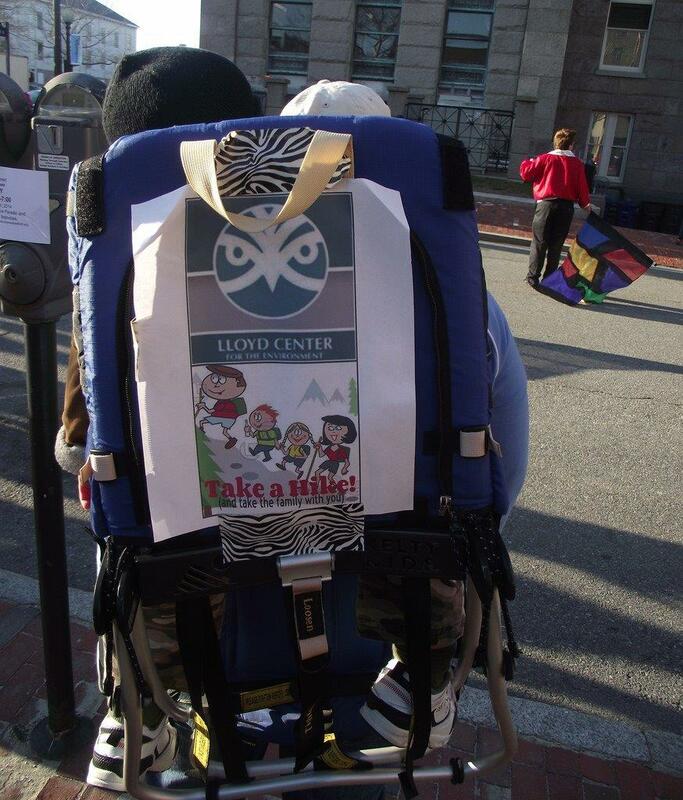 “Because of the Lloyd Center, we’ve definitely gained an appreciation for the wildlife and nature surrounding us. Going to school in Dartmouth several times a week, it’s easy to overlook the true beauty it encompasses. This project made us stop and look around”.